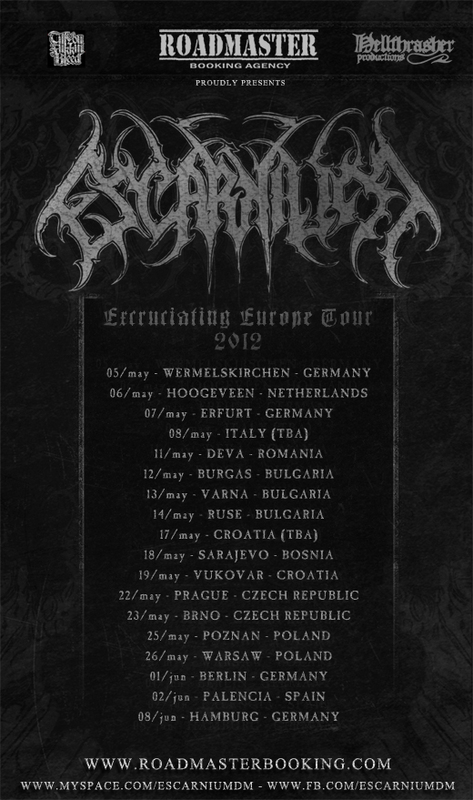 In May and June 2012 the Brazilian Death Metal band “ESCARNIUM” will be performing its first concert tour in Europe. The tour aims to promote the album “Excruciating Existence”, recently released by Hellthrasher Productions (Poland). The tour will pass through 10 countries: Germany, Netherlands, Italy, Romania, Bulgaria, Croatia, Bosnia, Czech Republic, Poland and Spain. ESCARNIUM made available for download a split with the band Incarceration, entitled “Decrepit Aberration.” To Download please visit: http://www.mediafire.com/?c36t09vcv1sn0h0. VIOLATOR anuncia datas da Eurotour 2012 !